It’s not only Sumi-e art that can be practiced mindfully. Every part of your day could have some element of contemplation, emotion or thoughtfulness about it. Whether you’re making breakfast for the kids or sitting in a traffic jam or stuck in another meeting - what might these daily activities look like if you brought a mindful attitude to them? What might my fish have looked like if I paid more mindful attention to the process? More lively, I bet. To become more mindful doesn’t require anything, except a small internal shift of focus, that’s all. Anyone can do it, and no one need ever know what you’re doing. There is no drama to mindfulness, and I suspect this is why many people forget about it. Instead of stressing about the day ahead while you’re making breakfast, what if you paid attention to the food you’re handling, and perhaps slowed down a bit? Instead of feeling resentment and impatience while stuck in traffic, what if you simply breathed and used this time to relax, to slow down a little? Can you imagine sitting in yet another meeting, paying full attention to each speaker, and really listening? Perhaps not so much to the message, which might be quite boring, but to the person who is speaking? On the outside, mindfulness doesn’t look like much. But on the inside, it creates a whole new experience. Mechanical living happens when we simply go through the motions of life. Like my fish painting above - I didn’t realise it at the time, because my mind was distracted and even though I knew I should meditate a bit before, and paint in conjunction with my exhales, I felt I knew what I wanted to paint. In my impatience, I simply started painting. The doing became more important than the being. 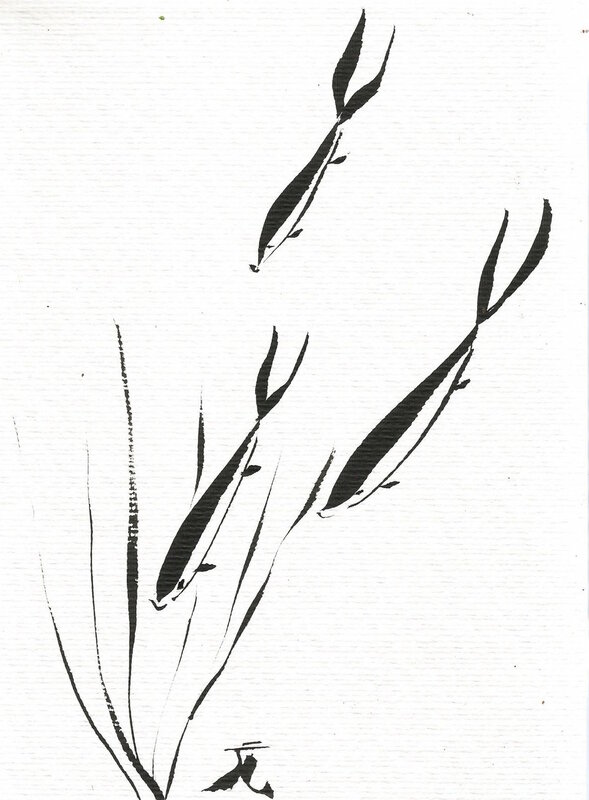 If I was being the fish, the painted ones would have shown more motion, fluidity and energy. Fish are, after all, alive and energetic and constantly moving about. None of this shows in the painting. As it is, they look more like straight arrows darting down to the bottom of the pond. We always seem to be waiting for a better time, sometime in the future, to pay attention to our lives. One day, when we’re retired, or one day, when the kids leave home, or one day, when you start doing yoga classes. Usually, that “one day” arrives in a far less pleasant way - perhaps in a doctors office, in your boss’s office being laid off. Unfortunately, many people only start paying attention when something painful happens to disrupt them from the daily routine life. Why wait for that wake up call? Living life mechanically misses the point all together. §It’s where doing becomes more important than being. So often, we fall into the trap of confusing doing with being. It happens when we get attached to the feeling of the end product, the satisfaction of the work complete, instead of focusing on the process. The end product being our achievements and goals (or sometimes just the end of the day) and the process being the steps we take and choices we make every single day, to get there. Once you start being mindful throughout the day, chances are you’ll very quickly be guided to leave your comfort zone. You’ll see things anew, have experiences that you didn’t have before, and the magic of every day life will unfold before your eyes. Because there really is magic to be found in the mundane. You just have to look for it. I don’t like my fish above. But I appreciate the reminder to pay more attention next time I sit down to paint, so that I don’t miss the point again. After all, if I didn’t paint these crappy fish, I would have missed the importance of being present to my art and comfortably continued in the same old way.